The Barnes Noble Nook (styled “nook”) is a brand of electronic-book readers developed by American book retailer Barnes Noble, The nook ebook format is specific to the nook, can only be read by the nook, it is new EPUB format file with eReader DRM combination created for the nook, that is different with EPUB with Adobe ADEPT DRM, sometimes called Adobe EPUB or Adobe Digital Editions format, you can’t read NOOK epub file directly on KOBO ereader, however kobo support some different types of ebook format files that can be read , include epub, PDF and others. B&N epub ebooks has drm protection only supported by NOOK, you need to remove drm protection before put epub file on other eReader devices such as the Kobo, Sony Reader, here’s how to remove drm directly from B&N epub. 1. 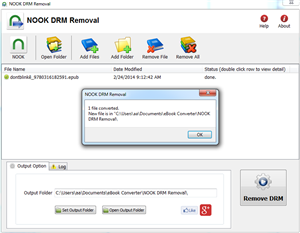 To start removing drm from B&N ePub files, you’ll need to install NOOK DRM Removal, click the Download link. 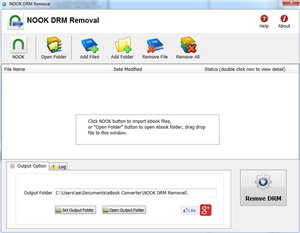 once you’ve download NOOK DRM Removal, install it as normal. 2.Once setup is complete, run NOOK DRM removal, select a epub from B&N ebook folder, then click “Remove DRM” button, NOOK ebook locate at “My Barnes & Noble eBooks” in “My Document” folder. 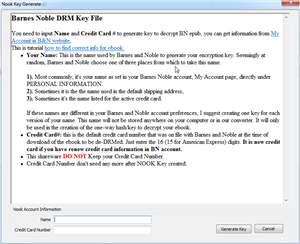 3.first times you need to input your Name of B&N account, and credit card number to decrypt drm protection, it is name in B&N account, not name on credit card, full digital number of credit card, this converter don’t keep these information, only to create a key file for next times. if Name and number is correct, it will create a epub file without drm protection. Now you can open your ePub file in any eReader program, such as Nook for PC. You can also transfer it to your eReader device, including Kobo or iPad, to read on the go. If you use a Kindle, you can also convert the ePub file to MOBI format with Calibre and transfer it to your device. The new Nook Simple Touch Reader eBook reader is the talk of the eReader market. It has a beautiful and functional design that is easy to use and places emphasis on comfort. We loved the feel of the Nook Simple Touch Reader in our hands and through our research found that users prefer its design to other eReader designs on the market. While the Nook doesn’t offer as many features as other top eBook readers, its design and navigation are superior.